To watch a manatee swimming toward the warm springs, only to be forced to turn around and head back to colder water upon being chased or encountering a wall of human legs blocking the spring run, is heartbreaking. Tell the U.S. Fish and Wildlife Service to make Three Sisters a true winter sanctuary for manatees; create additional Kings Bay winter sanctuaries at House and Jurassic Springs so manatees can rest undisturbed; and implement a no-touch policy for this endangered marine mammal. When manatees want to swim into the springs for vital protection, they must swim through a shallow, narrow opening while competing with swimmers, snorkelers, and kayakers all vying to touch and get as close as possible to the manatees. Endangered Manatees are rebuffed and are forced to return to colder waters by thousands of humans whose careless behaviors deny them access to or chase them from these critically important warm-water refuges. To see how it IS and how it COULD be, watch the video here. 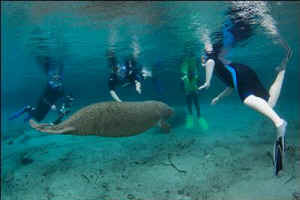 Endangered manatees travel to the warm springs of Kings Bay, in Florida's Citrus County, to survive the cold winters. Upon their arrival, they are rebuffed by thousands of humans whose careless behaviors deny them access to or chase them from these critically important warm-water refuges. The existing sanctuaries manatees have, which are off limits to this human interaction, are too small and too few. A case in point is Three Sisters Springs, where only two small sanctuaries exist, outside the springs. 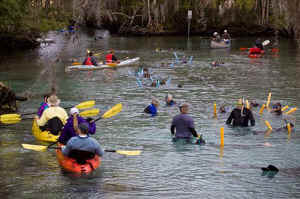 When manatees want to swim into the springs for vital protection, they must swim through a shallow, narrow opening while competing with swimmers, snorkelers, and kayakers all vying to touch and get as close as possible to the manatees. To watch a manatee swimming toward the springs, only to be forced to turn around and head back to colder water upon being chased or encountering a wall of human legs blocking the spring run, is heartbreaking. Thank you for helping to make Three Sisters Springs a true sanctuary for manatees!